Former NFL player Aaron Hernandez committed suicide in April of 2017 while serving time at Souza Baranowski Correctional Center in Massachusetts for the 2013 murder of Odin Lloyd. In the aftermath of the 27-year-old’s death behind bars, a new report by the Boston Globe found that the troubled late footballer hid a longtime sexual relationship with his high school quarterback and was also physically and sexually abused as a youngster. According to the paper, Quarterback Dennis SanSoucie engaged in a secret on-again, off-again romance with then-Bristol Central High School tight end Hernandez. “Me and him were very much into trying to hide what we were doing. We didn’t want people to know,” SanSoucie told the paper. Hernandez “had a feminine way about him” that his father, Dennis Hernandez, abhorred, the paper said. The abusive dad was quick to discipline his son for not appearing masculine enough, according to Hernandez’s brother, Jonathan. The father allegedly beat the boys fiercely when they didn’t live up to his lofty expectations, Jonathan said. Jonathan recalled a failed attempt to call the cops on his dad for beating on him and Aaron. The Globe also reports that both Jonathan and George Leontire, Aaron Hernandez’s former lawyer, say that Aaron revealed to them that he had been sexually molested as a young boy. Both declined to identify who that person would have been. 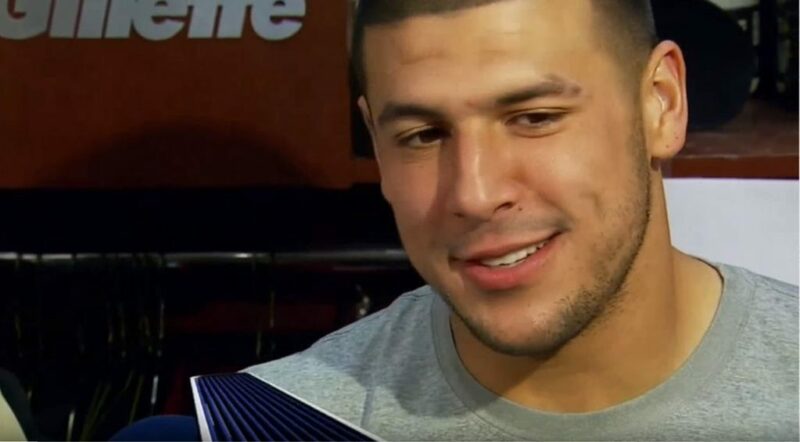 The post Aaron Hernandez Had A Secret ‘Sexual Relationship With High School Quarterback’, Says Ex-Lover appeared first on The Gaily Grind.